Lucca has such a lot to offer visitors! This lovely town is one of Tuscany’s most outstanding medieval walled towns and a walk around the almost completely intact 4km stretch of ancient fortifications will transport you back in time, as well as help you work up an appetite for some of the lovely Tuscan food you can sample in the town. Lucca also has some outstanding art and architecture to show off, but most people who visit Lucca come to see the walls, the towers or to attend one of the many summer festivals, so we will have a look at these three attractions in more detail. Nowadays the walls are a popular meeting place for locals, and thronged with walkers and cyclists in summer, but this was not always the case and they have had a turbulent history. The original walls were defensive, and built during Ancient Roman times, and few traces of these are visible today. The original Medieval walls were built in the 11th and 12th century and in the 14th century they had to be extended to accommodate the growing population of the town. The walls you see today were commissioned in 1504 in order to keep up with “modern” military advances, to ensure that Lucca could remain safe from the Medici. These walls were extremely advanced for their time, and required the collaboration of many Military architects from other parts of Italy. They were never breached! Along the 4 km stretch of walls you will find 11 bastions (all different from one another in design) and 3 gates. Inside the ramparts were large rooms to house soldiers, horses and munitions. The walls are always accessible to visitors and children especially will love exploring these ancient fortifications. Lucca once had about 130 towers – representative of the power and wealth of the families who built them. Sadly, only 2 important towers remain today, the rest having been demolished long ago. The most recognizable symbol of the city is the Guinigi Tower which has a huge Oak trees growing from its’ roof top garden! You will have a wonderful view of the town from the top of this tower if you can manage the 235 steps to the top! In the town you will also find the Torre delle Ore, or clock tower. 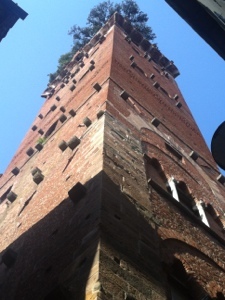 This one is taller than the Guinigi Tower and has provided the citizens of Lucca with a clock since 1390! It is open to the public if you fancy climbing to the top for another great view. If you have only few hours it makes sense to hire a local guide. By doing so you can explore on the highlights of the city and discover the long history that characterised Lucca. The guides are professional individuals who are trained by the local government, the town can be explored on foot in 2/3 hours. 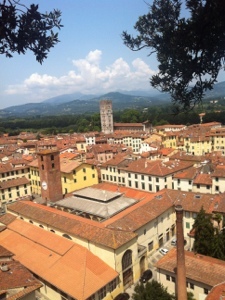 You can reach Lucca from Pisa, Cinque Terre, and Florence and it the the ideal destination for a day trip while you are on vacation in Tuscany. Previous Previous post: Brescia – Italy’s secret lake and wine destination.